In 1967 on a mostly deserted asteroid, the Old Woman of the Oak Forest is furious at not having received an invitation to the celebration of Lum’s birth. Thus, she has a curse created in the form of a crystal ball to prevent Lum from ever being with her true love. In 2267, a boy walks through a city to a garbage dump. There, he finds said cursed crystal ball and picks it up. 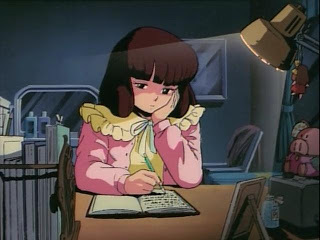 In the present (1985), Lum, Ataru, Shinobu, Shuutaro, Megane, Perm, Chibi, and Kakugari are at the library, where Shinobu explains the red string of fate concept to Lum. With the Tomobiki Marchenland theme park opening up, Lum gets Ataru to take her on a date there. Lum’s guard look for her and Ataru in vain. 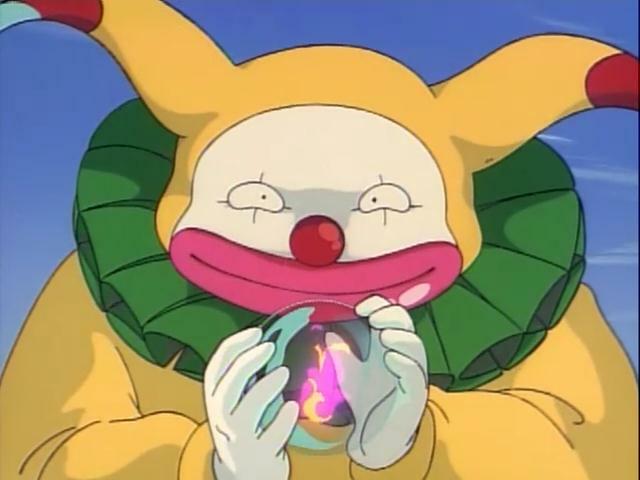 Chibi notes how weird the park is, made weirder when an unseen Pierrot (clown) with the crystal ball causes the four friends to encounter child versions of themselves. 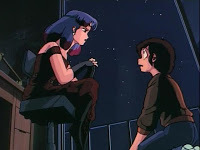 On an old-style sailing ship, Shinobu is with Shuutaro as he uses a looking glass to try to find Lum. Instead, thanks to the Pierrot, he finds the ghost of his first octopus. Ryuunosuke encounters a door with herself as Alice inside. Outside the park, Sakura and Cherry have detected the presence of youkai, but when they attempt to enter the park, they find themselves exiting from the rear exit. Repeated attempts to enter the park fail. A girl with animal ears and a raccoon tail hands out flyers for a magic show. 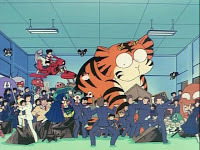 Lum, Ataru, and the others from the class attend. The animal-ear girl comes down the isle for a volunteer, so Ataru jumps at the chance, relishing the applause of the crowd. He’s put into a giant container, which the magician has covered with a blanket, then he shoots it. The blanket comes off, covering himself and his female assistant, who are no longer seen. After five minutes, Lum and company leave the audience to come on stage. Lum blasts the container, only to discover that Ataru has been turned into a pink hippo. 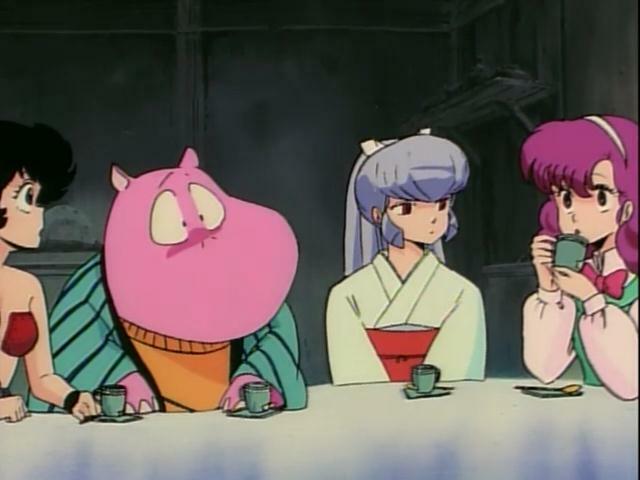 At home, Ataru’s mother is worried about Ataru becoming a hippo, but when Ataru’s father speaks of the money they could make, her worries vanish. Ataru’s only concern is how this impacts his girl hunts. 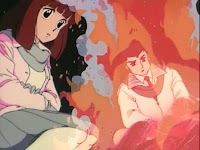 Sakura and Cherry come by with a dire warning that Ataru has been cursed and that it is likely to get worse. 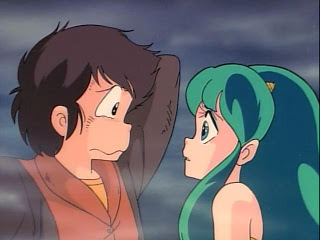 That night in Ataru’s bedroom, Lum vows to remain by Ataru’s side no matter what, causing him to be somewhat relieved. The magician shows up outside Ataru’s window, so Lum exits to confront him. 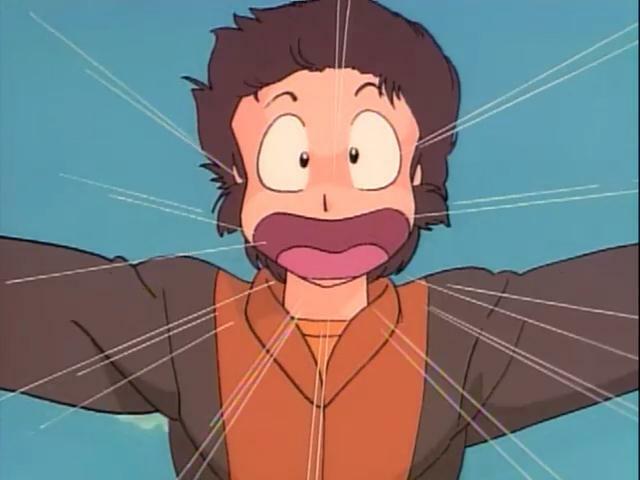 His name is Ruu, and he tells Lum to follow him if she wants Ataru returned to normal. He flies away, so Lum gives chase, getting mad and firing electric bolts but none connect. 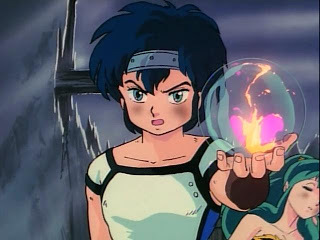 The chase ends at Tomobiki Marchenland in the Hall of Mirrors, where Ruu has trapped Lum in another world. The magician’s female assistant, Oshima, turns out to be a tanuki. Ruu turns out to be a young boy, who recounts how he found this crystal ball, traveled in time, met Lum, and fell in love with her smile. However, he notes that since Lum hooked up with Ataru, she no longer smiles the way she used to. He shows Lum a window where Ataru, still a pink hippo, is at school in the bathroom. She tries to call to him, but he cannot hear her. Lum tries to escape, but finds they are on an old sailing ship floating in some crystal landscape. Ran learns something of Lum’s disappearance and summons Benten, who takes the two to see Oyuki. A discussion leads the women to the conclusion that it is Lum who’s cursed, not Ataru. As such, they consult with Lum’s parents, who recall the Old Woman of the Oak Forest getting angry when she thought she’d been snubbed for the celebration of Lum’s birth when in fact her invitation had been lost in the mail. The group pays the old woman a visit. She reveals that she used the Milky Way ‘Curses-R-Us’ Management Organization service, which Ran knows quite well. However, the old woman had the curse canceled when she learned she wasn’t snubbed. 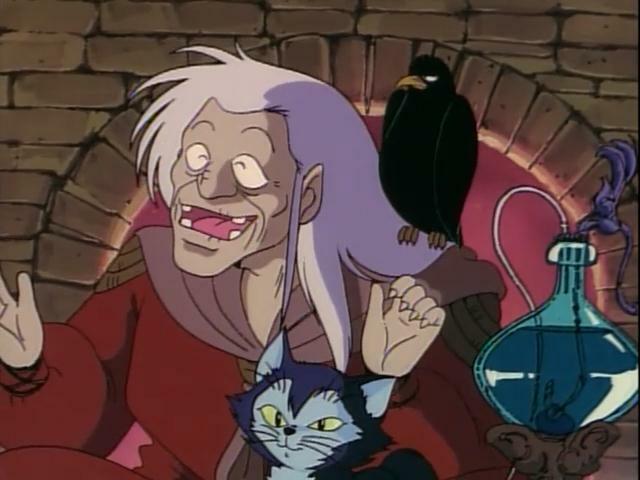 The group pays a visit to the company, where they learn that the cursed crystal ball was lost in delivery, but the curse is very much active. With there being nothing they can do to get Lum back, Benten takes Ten-chan home. Oyuki takes Lum’s UFO out of orbit, and Ran leaves in her spaceship. Shinobu records that Ataru returns to being human and immediately starts girl hunting. She lost her incredible strength while Shuutaro and Ryoko lost their abilities to commune with their beloved octopi and tree respectively. 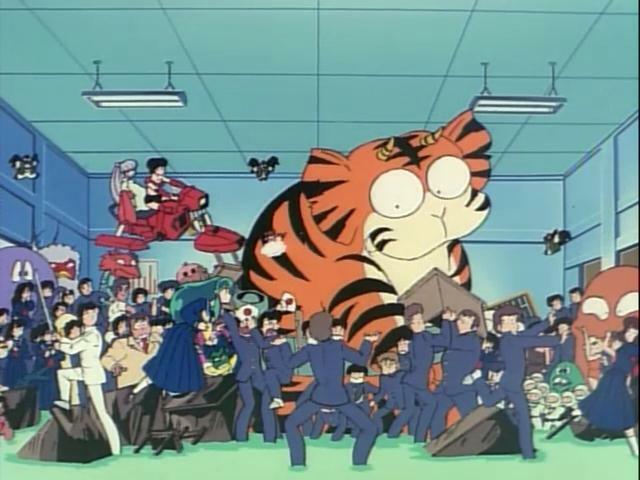 Megane takes a trip, which upon completing, he decides to destroy all the mementos he has of Lum. Taking his collection into the night, he’s met by the other three Lum guards, and they meet Shuutaro and Shinobu before lighting the stuff on fire on a hilltop. With the start of their third year of high school, Ataru is girl hunting and while taking a break, accidentally cuts his finger. He’s reminded of Lum and the red string of fate. Ataru realizes that without Lum, the thrill of girl hunting is only half as much. Ruu’s private teacher, Lahla, reveals herself, having observed Ataru ever since Lum was taken. She explains what is going on and takes Ataru to Tomobiki Marchenland’s Hall of Mirrors. 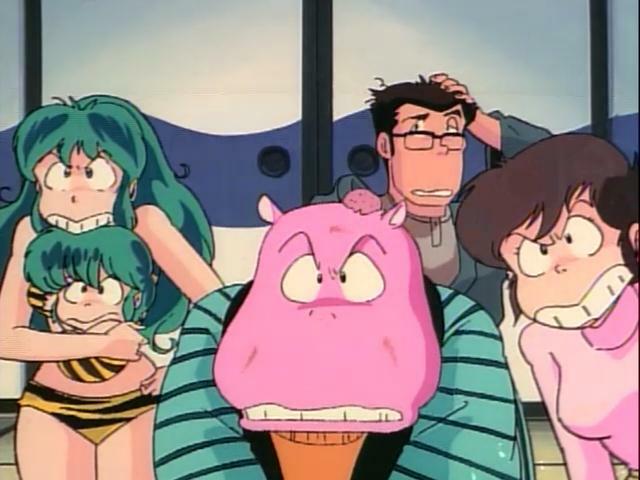 He tries to focus on Lum, but can’t help but think of his harem fantasy, thus they arrive there. A second attempt sees them through, aided by Lum’s preventing Ruu from moving the ship to another realm that Lahla couldn’t reach. The crystal ball prevents Lum and Ataru from hugging, putting them into the bodies of butterflies. However, Lum is easily able to find Ataru. The two are thrown back in time into the bodies of brontosaurus, but again, Lum finds Ataru. The crystal puts them into the bodies of seagulls, but the results are the same, causing the crystal ball to crack each time. 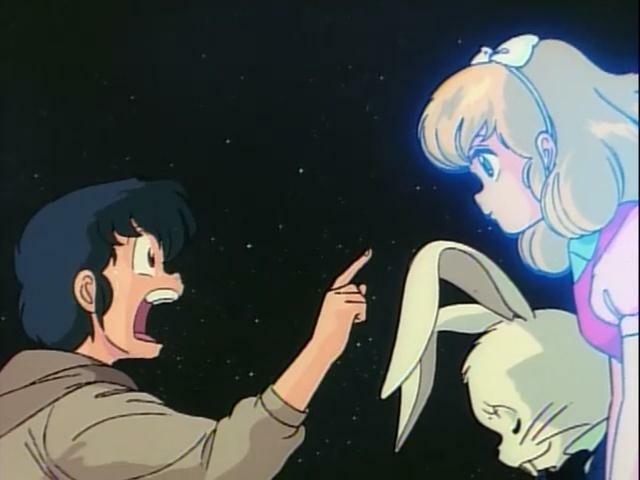 Lum sees the red string of fate and finds Ataru. However, he’s embarrassed to reveal his hand because he has countless red strings attached to him. 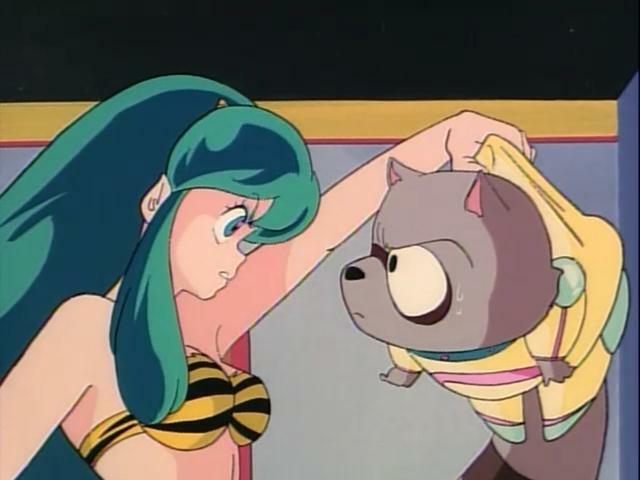 Lum is not amused and fries him, causing the crystal ball to shatter. Ruu, who discovers from Lahla that Lum is his ancestor, sends them back in time so that they have no memory of the events that transpired. As such, the Tomobiki Marchenland is about to begin, only this time without the supernatural elements. Insanity ensues when everyone shows up in Onsen-sensei’s class, leading Lum to announce that they all go to the amusement park. Well, we have another somewhat surreal movie, but not as surreal as the previous one. Initially, I was kind of bored with this movie. The OP theme has to play an entire song, which made me feel like a teenager again since the song sounds so 80’s. Also, the scenes where Ruu, as the Pierrot, caused the others to experience weirdness dragged quite a bit. 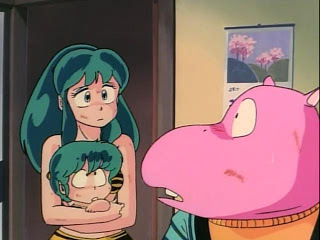 The movie dragged again when Lum started thinking about her life with Ataru prior to his transformation to a pink hippo. That was followed by a chase that I felt went on too long. 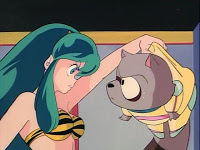 And, I wanted to spin on with the scenes where Lum and Ataru are different creatures, mainly because the music drove me spare (so much so that I muted it). Pacing issues aside, the story itself is pretty much a by the numbers thing. Lum deeply loves Ataru; Ataru loves Lum, but also loves other girls; Ataru doesn’t want to admit his love; Ataru is forced to admit his feelings when he’s a hippo, and again when he loses Lum; Ataru has to find Lum and bring her back. So plot wise, there were no real surprises other than the parody witch lady having canceled her curse, and I would have caught that had I been paying closer attention. The part of the movie that was of most interest to me was the aftermath of Lum’s abduction. Having Shinobu narrate this transition phase worked quite well. Further, the fact that she lost her great strength since Lum left was quite compelling to me. That was added to by having Shuutaro and Ryoko both lose their abilities to commune with octopi and a tree respectively. The fact that the core group around Lum and Ataru came together in an unplanned moment and burned the mementos of Lum was symbolic of their new beginning without Lum. I wouldn’t have been able to do in that situation. I could understand Benten, Oyuki, and Ran leaving earth for good (along with Ten-chan) since Lum wasn’t there, but it seemed odd to me that they wouldn’t continue trying to find her. Come to think of it, why’d everyone give up on Lum? Yeah, I’m guessing it was all part of the curse though that was never explicitly stated that I recall. While establishing that Ruu is the descendant of Lum, I note that they are careful to not say that he’s also a descendant of Ataru. I’m guessing that’s partially because the manga was still going on at this time, and there was always a possibility that Takahashi-sensei would have Lum hook up with someone else. I figured Lahla might be a descendant as well, but that was never stated. Heck, at some point, before Lahla’s identity was revealed, I wondered if she might be Lum from the future trying to get things set back to right. There were really no funny moments in the movie, though some attempts at jokes were made. While I didn’t laugh, I think the most amusing moment came from the embarrassed Ataru revealing he had lots of red strings attached to him, followed by Lum’s natural (if delayed) response. One side note – I know these are old translations, but I had to laugh at the absurdity of the fear of a Japanese title/honorific being so great that a French honorific had to be inserted to try to capture the moment (an “oneesama” was replaced with “mademoiselle”). *lol* Then again, we really haven’t progressed too much beyond this when it comes to official anime subtitle translations after FUNimation abandoned their trendsetting ways. In the end, despite some pacing problems and some music that made me cringe a bit, the movie wasn’t all bad. It was predictable in terms of plot, but I was entertained, which is what matters most. I liked Movie 3 more when Animeigo was still releasing the early part of the TV series and this movie was the only opportunity to see what the later TV designs would look like. But in hindsight, this movie is more average compared to Movies 1,2,4 and 5 which all act as either bookends to the franchise (1 and 5) or to the TV director’s careers (2 and 4). Movie 3 is just a by the numbers UY movie with a hint on romantic melodrama. I’m warning you now, if you watch Movie 4 and it makes NO SENSE don’t worry…it didn’t make sense to the Japanese audience nor the staff who made it. > It just made me wonder how much of this whole girl-hunting business is genuine and how much of it is only an act and not what he truly craves. Hard to say. There’s no doubt that Ataru just loves women, but I’ve long thought that in his ultimate harem, Lum would be the chief girl of that harem.